It also delivers superior nutrition by minimising nutrient loss from exposure to weather. Designed with 4 feeding ports it enables 4 horses to feed simultaneously. Manufactured from robust plastic to protect hay in all weather conditions. Please note that shipping costs for this item are for England and Wales only. If you require delivery outside these areas (eg Scotland or offshore) please contact us for a shipping quotation prior to placing your order or your order will not be accepted. JFC Large Horse Haybell Feeder. JFC Haybell, the round bale cover feeder for Horses. Minimises wastage due to trampling and fouling and saves you money, with less wastage and reduced labour. 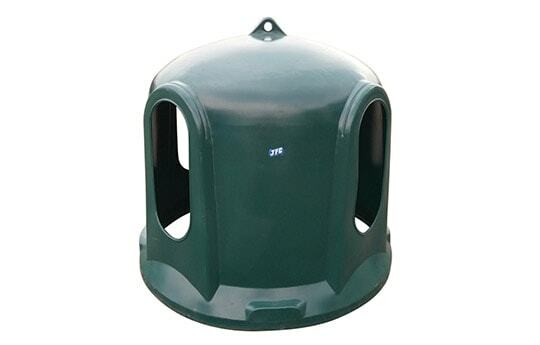 The Large Haybell delivers superior nutrition retention by minimising nutrient loss from exposure to weather. 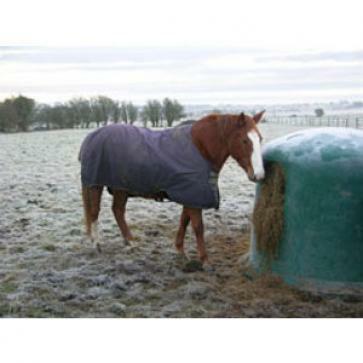 The Horse Haybell is easy to manoeuvre it allows flexible positioning in the paddock or field. It has no metal components making it extremely safe for use with horses. The JFC Large Horse Haybell has easy access to hay, via large open access windows, with weather protection from rain and snow. Please note that shipping quoted is for England and Wales only, for Scotland, Offshore and Europe please contact us for a shipping quote prior to placing your order.